As promised I am showing you some cards that I made a few days ago. One evening while not much was on tv I sat and got a number of cards made. 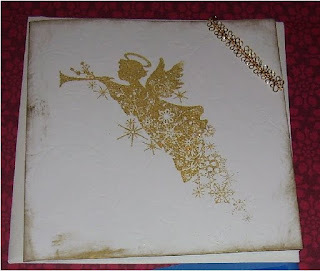 This angel card I stamped with a gold stamp pad then I sprinkled on some gold glitter embossing powder. You can't see it here but it is so glittery and the details in the stamp really show up nicely. 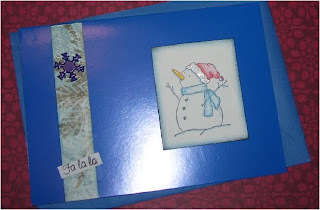 I added a bit of gold ribbon at the top and smudged some gold ink on the edges of the card as well. And some snowmen always have to make an appearance in my house over the holidays. I made a few of these cards. I used some snowflake brads and various papers and ribbons. I also did this in a Christmas green colour with the snowman's scarf in green and red and it turned out soo cute. 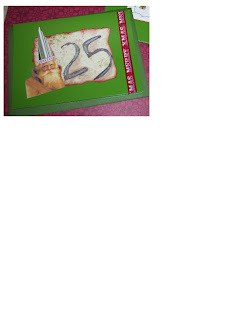 And this last card, sorry the pic is so small, I made an altered Santa. I just love these long tall pointy hats. I made the " 25" stamp out of fun foam, put a little glue stick glue on the numbers and placed it on my acrylic stamping blog then stamped on the paper. I just love how it turned out and I will be making more of my own stamps out of fun foam from here on. I have some new things I want to do and try in the new year with canvas. I purchased a book by artist Alisa Burke called " Canvas Remix" and she has some wonderful techniques and ideas using canvas, painting stamping the making purses and art. I finished a painted project today for my Mumsy and will take a pic of it to show you all later. I might have to wait till I give it to her this weekend before I share it online here. It was a little more time consuming than I expected but it turned out so nice, it was well worth it. Just a little HoHo for her Santa collection. Thank you to those that left comments and prayers for me and my family in my last post. The power of prayer is a wonderful thing!!!! The angel one is stunning! Hard to read the type on red background. maybe i need new glasses. Your cards came out great. Yes, that foam makes great stamps. I use double sided removable tape. I stick a couple of stripes of it across my acrylic piece and it holds up for several uses even running water over it to clean off the excess ink. Then it can be removed and a new strip put down. By the way, I found that pad I had for the static! Yay.